Which brings us to a pretty good new Sample box which I will be buying as soon as I finish writing this post! It is a Snack Sample Box. 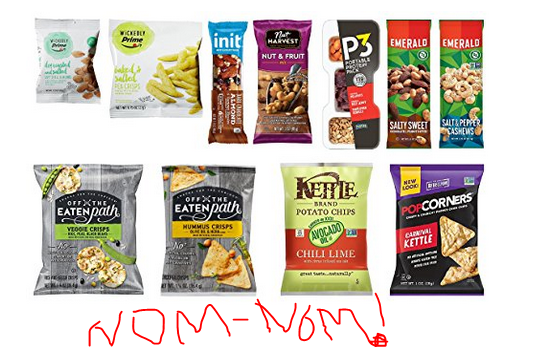 You pay $10 for it, with free shipping (not eligible for 2-day shipping though), and you get a minimum of TEN different snacks. Examples are shown and listed on the page over there. They are a mix of snack bars, nuts, and various crisps. All ten of them look very acceptable to me. So one week after your order above ships, you will get an email telling you that a $9.99 store credit has been automatically added to your Amazon account. There’s no coupon code to enter. The store credit is loaded to your account behind the scenes. You can use that $9.99 to make a purchase of any combination of eligible products from a choice of 150+ products. This includes 15 products that are Amazon’s own food brand, the “Wickedly Prime” products. Use the options on the left hand side over the to filter them.